As part of the special initiative “A world with no Hunger ” (SEWOH), BMZ commissioned GIZ to implement the Fish for Nutrition project for the period 2017-2021. The overall objective of the project is to improve the food and nutrition security of returning refugees, internally displaced persons and vulnerable host community. More specifically, it aims to support the Government of Somalia with the improvement of the food and nutritional security of vulnerable populations in Kismayo, Somalia through access to fishery products in Kismayo town, Lower Juba Region of Somalia. What led to the installation of the project? Somalia has been regarded as a fragile state since the collapse of its government in 1991. Prolonged internal civil strife, which has lasted for almost 30 years, has led to a large-scale breakdown of the country’s political, social and economic structures. As a result, a majority of the population live in poor conditions with no access to basic services. There are more than 2.1 million internally displaced persons in Somalia and another million living as refugees in other countries. Still, many political milestones have been realized in Somalia within the last four years culminating with the democratic election of a president in February 2017. In September 2012, the Somali National Army and AMISOM troops re-captured the city of Kismayo from the Al-Shabaab insurgents. The Juba Interim Administration was subsequently officially established and recognized in 2013. Kismayo is a coastal city with a limited fishing culture. Its current population is made up of nomads, farmers whose traditional diet is animal meat and the original coastal community. The city’s fishery resources are underutilized. 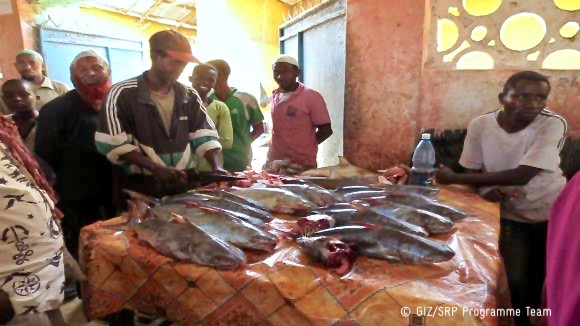 It has limited fish markets and the majority of the Kismayo population do not have access to fresh fishery products. The food security for returnees, IDPs and vulnerable inhabitants in Kismayo is fairly very weak. Fish has particularly high micronutrients and protein content and could, therefore, contribute considerably towards an improvement of the state of nutrition and food security. 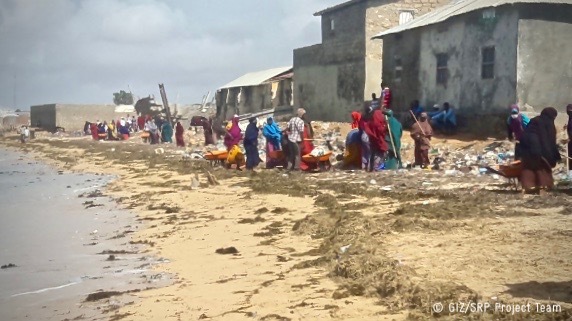 Kismayo has the potential to be a prosperous coastal city, given the long coastline and an overabundance of marine life of limitless variety in its coastal waters. Fish loses at catch and subsequently during marketing are very high at present. Low knowledge about the nutritional benefits of fish by the community members and absence of an effective cold chain, from catch to sell, as well as the absence of market outlets for fish traders, all contribute to the overall situation where fish, which is highly nutritious, is not consumed as much by the local populations. The project’s strategy, in accordance with government policies, the Somalia 2017-2019 National Development Plan, and the Jubaland Ministry of Fisheries and Marine Resources five-year plan, aims to improve the food security situation of the Kismayo population. The strategy adopts a multi-stakeholder approach involving various target groups and stakeholders and allowing for the active participation of stakeholders in both planning and implementation. Activities are developed in consultation with stakeholders and are implemented and monitored through the project’s cooperation with target beneficiaries, as well as government, and national and international partners. Harmonization of planned activities with other actors including local and international NGOs as well as existing coordination structures such as the Kismayo NGOs’ Fisheries working group is ensured. The principles of gender equality and of conflict reduction and resolution, between various population groups, are practiced and integrated during implementation. Raising awareness on fish consumption. This involves creating awareness on the benefits of fish consumption using various communication tools targeting the general population, as well as specific population subgroups. Ensuring availability of high-quality fishery products by reducing the amounts of fish loses, improving on cold chain measures as well as the implementation of capacity building measures for fishermen and fish traders on Fish handling and hygiene. Improvement of Infrastructural conditions for the improved availability of nutritionally relevant foods. This involves providing infrastructural rehabilitation to fish markets and supporting nutritional health facilities to start offering nutritional counseling. Activities implemented to date can be broadly classified into: Trust-building measures, with a focus on environmental awareness and drought response (food distribution), capacity strengthening measures targeting partner ministries and beneficiary groups and finally, various studies were undertaken to inform baseline project measures. The intervention was designed to improve the livelihoods of internally displaced persons as result of the 2017 drought. 1200 households were reached with various interventions including water tracking and food distribution, for new IDPs. The water tracking reached 18 camps which had been identified as not having clean drinking water. Strengthen its technical capacities in quality control, compliance and monitoring and evaluation. 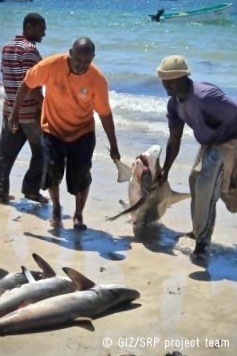 Improve its landing site supervision and monitoring of fishing activities in Kismayo. Improve on formulation and implementation of functional policies and tools aimed at strengthening its monitoring roles. Training of selected ministry staff on quality control, monitoring and evaluation and approaches to recording fish data. 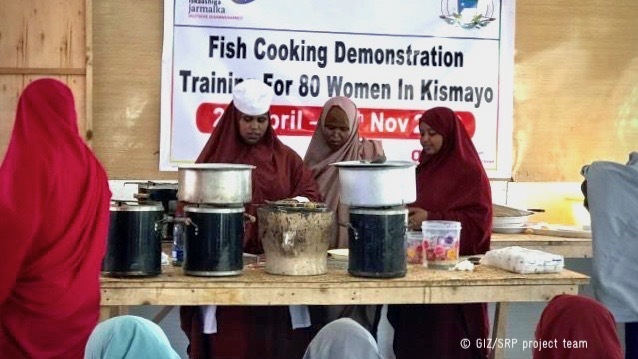 The project implemented cooking demonstrations with the aim of increasing household fish consumption by improving local women’s knowledge about fish consumption benefits and improving their fish handling and cooking skills. These trainings are ongoing with a total of 100 hundred women expected having been trained by end of 2018. Appropriate fish handling and processing is an essential complementary function in delivering quality fishery products to the consumers. 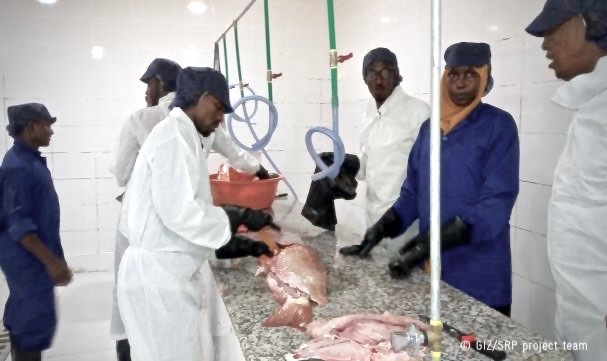 ARC was subcontracted to train 10 TOTs, who by extension trained 100 fishermen involved in the fish value chain in order to enhance the capacity of fishermen on the effective hygienic handling of the fish during harvesting, processing, marketing and preservation. The objective of this survey was to establish base of the community’s knowledge, attitude and practices around fish consumption, as well as to design a communication strategy to guide implementation of project activities. Study findings will guide project implementation as to the best approaches to promote fish consumption as well as the ideal communication channels and media to adopt for the planned fish awareness campaigns. This baseline study’s main objective was to collect benchmark data on the project indicators; quantify current fishery data (e.g. 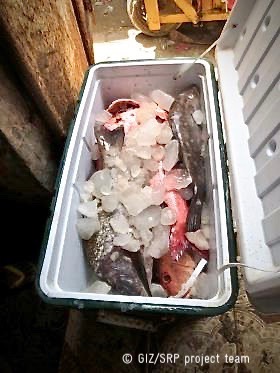 amounts of fish landed, quantities of fresh and processed fish sold, and quantities of post-harvest losses). The study also determined general availability and accessibility of health facilities with functional kitchens and functioning fish markets. A joined (Kismayo GIZ programs) peace and conflict analysis study was undertaken with the purpose of increasing awareness about program-related conflict challenges and risks emanating from Kismayo, as well as from political and security developments. The project will be aware of relevant conflict drivers that can be mitigated in order to reduce negative consequences for the project and maximize positive ones. Within this period the Fish for Nutrition project will focus on 1) raising awareness on fish consumption, 2) ensuring availability of high-quality fishery products by reducing the amounts of fish loses 3) improvement of infrastructural conditions. This output aims to increase the awareness of the Kismayo population in regards to the benefits of fish consumption. This will be done by working with the Ministry of Information and Communication to strengthen its institutional capacities in selected areas, as well as with private media firms enclose collaboration with relevant government agencies/ministries to pass information about the benefits of fish consumption using radio, TV and the print media to the general population. In collaboration with the Ministry of Fisheries and Marine Resources, the project intends to support further training of more fishermen on fish hygiene, quality and processing. Support towards the development of a training policy shall be offered first, with a two-pronged approach planned for — newer trainees will be trained on the basic course units, while the older trainees will be given more practical as well as theoretical orientation allowing for them to become TOTs. The project will also continue implementing cooking demonstrations by training vulnerable women from none fish eating households on the benefits of fish consumption, fish selection, preparation, handling and cooking skills in order to increase household fish consumption. The project is also exploring off-grid solutions to developing cold rooms for fish storage in fish markets. Sustainable solutions allowing for local fishermen to independently manage such storage facilities would be considered. Under this output, the Alanley, Dalcada and Kibora fish markets will be renovated, with the inclusion of sanitary facilities for fish processing as well as durable solutions to water availability. In addition, the ministry will be supported by the construction of data collection shades at Alanley and Kibora landing sites to strengthen its capacity in data collection. The Fish for Nutrition project intends to implement pilot activities within the 2018/2019 period in three broad areas: School feeding programmes, nutritional counseling and awareness creation at health facilities, and in fish drying and salting. A pilot school feeding intervention will be implemented in partnership with the Lutheran World Foundation, which intends to create mass awareness on the importance of fish consumption and to improve the food security of school going children in five selected schools in Jubaland. It will also support in the development of age-appropriate curricula to integrate fish nutrition into the learning content for selected schools. In partnership with the Ministry of Health the project will implement a pilot intervention on the integration of fish consumption awareness into currently existing nutrition promotion interventions within MoH facilities. The inclusion of fish nutrition into the Maternal and Child Health IEC materials used for nutritional counseling, training of MCH providers, and implementation of counseling awareness sessions on the benefits of fish consumption to women of reproductive age will be undertaken within this period. 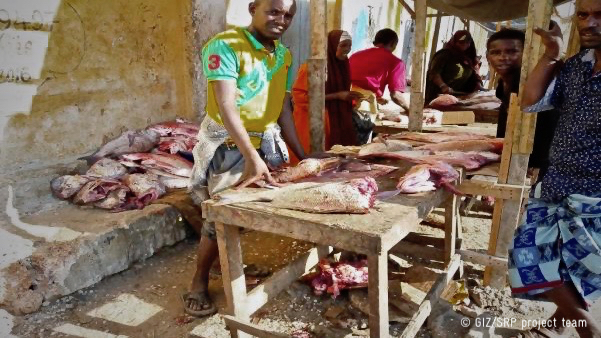 Climatic conditions in Kismayo allows for fish drying and salting as an applicable mode to fish preservation, and therefore reducing fish loses. Approaches and partners that can be involved in developing activities on this mode of preservation are currently being explored.